DEBUGGING. Typically, engineers want to get bugs out of their creations. Not so for the U.K. engineering firm (not the famed carmaker) Rolls-Royce — it’s looking for a way to get bugs into the aircraft engines it builds. These “bugs” aren’t software glitches or even actual insects. They’re tiny robots modeled after the cockroach. On Tuesday, Rolls-Royce shared the latest developments in its research into cockroach-like robots at the Farnborough International Airshow. ROBO-MECHANICS. Rolls-Royce believes these tiny insect-inspired robots will save engineers time by serving as their eyes and hands within the tight confines of an airplane’s engine. According to a report by The Next Web, the company plans to mount a camera on each bot to allow engineers to see what’s going on inside an engine without have to take it apart. Rolls-Royce thinks it could even train its cockroach-like robots to complete repairs. NOW MAKE IT SMALLER. Rolls-Royce has already created prototypes of the little bot with the help of robotics experts from Harvard University and University of Nottingham. But they are still too large for the company’s intended use. 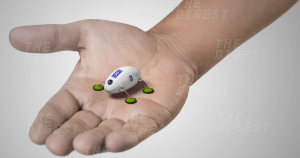 The goal is to scale the roach-like robots down to stand about half-an-inch tall and weigh just a few ounces, which a Rolls-Royce representative told TNW should be possible within the next couple of years.